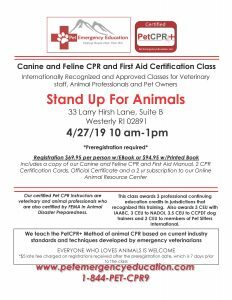 $69.95 Registration fee Includes: 2 CPR certification wallet cards, An official certificate, a 2 year subscription to our online Animal Emergency Resource Center, your choice of the 88 page full color class manual either as an Ebook (View Only/Cannot be Printed) or a printed copy (additional $24.95), businesses, organizations and groups may request a professional, frame-able certificate and window decal, to hang in their place of business to promote that their staff/members are certified. Learn about the importance of the pet first aid kit and how to use the materials in it during an emergency. How to manage and provide first aid for many common medical emergencies such as severe wounds, poisoning, burns, choking and more.